If you’ve ever experienced a thunderstorm, you’re well familiar with the ability of Earth to build a static charge on its surface. When that static build-up reconnects with a similar build-up in the sky, the resulting current is seen as lightning. We’ve long known that a similar static buildup can occur on other solar system bodies. We’ve observed lightning storms on Jupiter, Saturn and Venus, for example. Of course these planets all have thick atmospheres, so what about bodies without atmospheres? One example we know of is the Moon. Data from the Lunar Prospector mission found that the portions of the Moon’s surface could build electrostatic potentials as high as 4,50o volts. They are generated either when the Moon passes through Earth’s magnetotail, or when a solar storm bombards the Moon with charged particles. With no atmosphere the Moon can’t discharge these as lightning, so it generally leaves the surface gradually. Sometimes static charge can build within the dust of the lunar surface. The charged dust particles repel each other, and this can create levitated dust clouds. Such an effect was seen during the Apollo missions. It has generally been thought that charge could build on the surface of other airless bodies, but there hasn’t been any direct evidence of it. Now a new paper confirms the effect for Saturn’s moon Hyperion. The authors looked at data from the Cassini mission, specifically a detector known as the Cassini Plasma Spectrometer (CAPS). This device looks at the energy of charged particles striking Cassini. 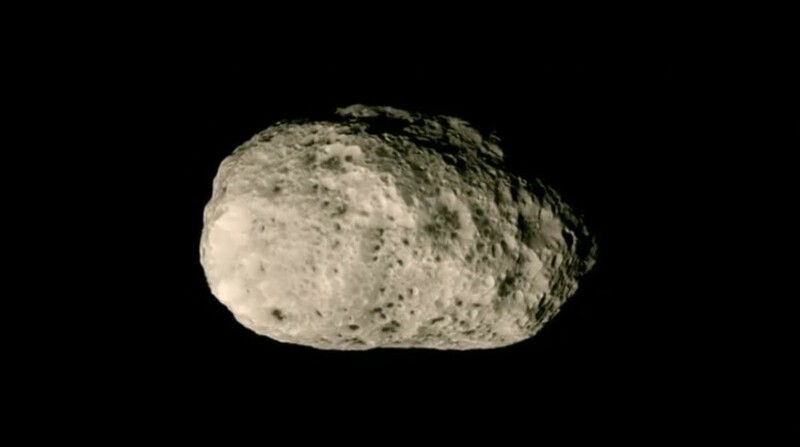 During a close approach of Hyperion, CAPS detected a strong current of electrons. It was a discharge of about 200 volts over a distance of 2,000 kilometers. Hyperion doesn’t interact strongly with Saturn’s magnetosphere, so it’s thought that the moon’s charge build-up is due to ultraviolet light striking its surface, which can knock electrons away from the surface via the photoelectric effect. This supports the idea that other outer planet moons can experience similar charges on their surface. Just as we can get a charge out of seeing our spacecraft make a close approach of a moon, it seems the spacecraft itself can also get a charge. Very well explained Prof. Koberlein. However when there is a static, it means a surface is +vely or -vely charged. When Hyperion saw Cassini, did it discharge via Cassini? If yes, that means Cassini was neutral. How do we maintain a spacecraft’s charge neutral? How do we earth them, cos theres no earth. Also, why is the paper saying that they were magnetically connected. I am unable to understand how a discharge will connect the spacecraft and the satellite magnetically. Thanks for the write up. Can I subscribe to your blog?